This is one of the most dignified and self-assured images of royalty in Vigee Le Brun's oeuvre, vet when it was painted, the sitter was a pathetic figure living in exile in Saint Petersburg on charity supplied by the Czar of Russia. Born at the Castle of Wolczyno in Lithuania, Stanislas Augustus (1732-1798) was the eighth child of the companion-in-arms of Charles XII of Sweden, Count Stanislas Ciolek Poniatowski, Palatine of Cracow and his wife, Princess Constanza Czartoryska. After serving as an officer in the Russian Imperial army, he traveled extensively in Western Europe. In 1756, with the help of his influential Czartoryski relatives, he was accredited at Saint Petersburg as plenipotentiary ambassador from Poland. Leon Naryshkin and the British ambassador, Hanbury Williams, introduced the young Count to Grand-Duchess Catherine Alexievna, the future Catherine II, and the two became lovers. Embroiled in a conspiracy to deprive Catherine's husband and son of the throne, Poniatowski was recalled in 1758. Catherine at once replaced him with Grigori Orloff. When she seized power in 1762, having had Peter III assassinated, she resolved that her former paramour would succeed Augustus III of Saxony as King of Poland. Since the majority of the Polish nobility regarded Poniatowski as an upstart, the Czarina sent in her Cossacks and through the use of force had him "elected" to the throne on September 7, 1764. He was never to be more than a puppet monarch, and his unfortunate reign was a long succession of indignities, the most cruel of which was the first partition of Poland by Russia, Prussia, and Austria (1772). In 1782 he accompanied Catherine and Potemkin on their triumphal progress through the Crimea and was humiliated by her on more than one occasion. He maneuvered as best he could through the events leading to the adoption by the Polish patriotic party of a Constitution (1791), but lacking courage at the critical moment, he switched allegiances and joined the pro-Russian Confederation of Targowiqa. Poland was then invaded and plundered a second time (1793). He officially outlawed the leader of the patriotic insurrection, General Thaddeus Kosciusko. Russian troops took Warsaw in November of 1794. Once again, Poniatowski owed his throne to Catherine's intervention. In January 1795 she ordered him to depart for Grodno, and on November 25 of that year, he was made to abdicate. When the Empress died, her son Paul I summoned the deposed King to Saint Petersburg. In March of 1797 he and his retinue were installed in the magnificent Marble Palace near the embankments of the Neva. Old and in poor health, he attended Paul's coronation in Moscow, and as a final degradation he had to remain standing during the entire ceremony. On February 12, 1798, the last King of Poland died of a stroke in Saint Petersburg and was buried there with considerable pomp in the Catholic Church of St. Stanislas. Women played a major role in the life of Stanislas Poniatowski. He was secretly wed to a Countess Gradowska, but their union was childless. Much of his affection was heaped on his sister, Countess Louise Zamoiska, and her daughter, Countess Urszula Mniszech. He had a number of mistresses, including Mme Lullie, the widow of an upholsterer, and counted among his egerias Countess Brilhl and Anna Ivanovna Bestujeff. However, his most memorable friendship was with the Parisian society matron, Mme Geoffrin, with whom for many years he kept up a lively correspondence and whom he affectionately called "Maman!' 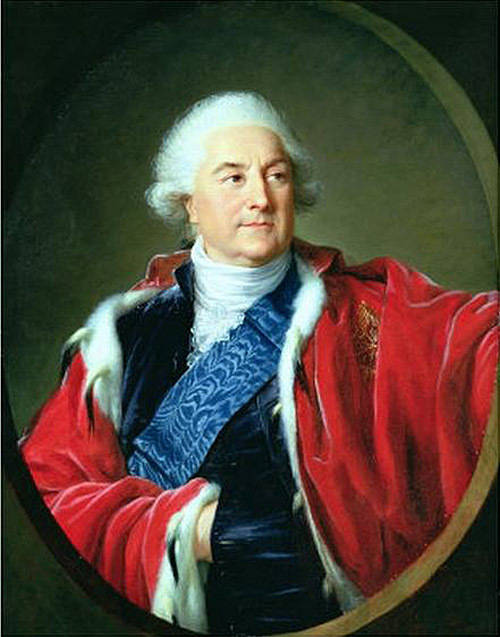 " A patron of the arts and an ardent francophile, he sought the fashionable Mme Vigee Le Brun soon after his arrival in Saint Petersburg: "On March  the King, accompanied by two ladies of his family, Count Mniszech and gentlemen of his suite, went to visit the studio of the famous Mme le Brun who had asked several people whom she had painted for the temporary return of their portraits. In her studio on this day [these works] equalled the great reputation of this celebrated artist." ("Journal prive du roi Stanislas Auguste pendant son voyage en Russie pour le couronnement de l'empereur Paul ler," in Memories secrets et inedits de Stanislas Auguste, comte Poniatowski, dernier roi de Pologize, Leipzig, 1862, p. 71.) With Countess Mniszech he returned to Vigee Le Brun's studio on May 25 for a showing of her latest works and they were found to be "of great perfection" ("Journal prive," p. 138). They subsequently met on numerous social occasions. Her first likeness of Stanislas Poniatowski - the one presented here - shows the subject regally attired in a red velvet cloak lined with ermine, his right hand inserted in a black satin vest, the wide blue moiri silk ribbon of the Order of the White Eagle barring his chest. It was engraved by Klauber, and Mme Le Brun thought so much of it that she kept it for her own collection. Mme Ancelot in her Salons de Paris records that around 1830 she saw it hanging in the artist's apartment alongside a portrait of Catherine II (Paris, 1858, p. 39), and it is mentioned in the inventory of Mme Le Brun's possessions drawn up after her death. In the same year of 1797, Countess Mniszech commissioned Vigee Le Brun to paint a portrait of her uncle sporting a fanciful costume "A la Henri IV" and a large medallion bearing the insignia of the Freemasons. That signed and dated work is now in the Museum of Western and Oriental Art, Kiev (see A. Ryszkiewicz, 1961 and 1966, cited - below). In addition, Mme Le Brun executed for the Mniszech family the charming portrait of the Countess's daughter, Elisabeth Isabella, holding a dog (now in Akademija za Likovna Umetnost, Ljubljana, Yugoslavia). Mme Le Brun described Poniatowski as tall, endowed with a handsome face expressing "gentleness and benevolence" (Souvenirs, III, 30). In the short time they knew each other, he came to call her his "bonne amie" and assured her how pleased he would have been to receive her in Warsaw during his reign. His kindness was really unparalleled. I remember having myself experienced a proof of this, and its recollection makes me feel ashamed. When I am painting, the only person I wish to see is my sitter. On more than one occasion, this had made me act rudely to those who interrupt me while I am at work. One morning, as I was busy finishing a portrait, the King of Poland came to see me. Having heard the sound of several horses at the door, I suspected that it was he who had come to visit me. I was so absorbed in my work that I lost my temper, just as he was opening the door I shouted "I am not in." The King, without uttering a word, put on his cloak and departed. When I set down my palette and remembered in cold blood what I had just done, I was so contrite that I went that very evening to the King's residence in order to make my apologies and beg forgiveness. "How you received me this morning! ", he said as soon as he saw me. Then he added immediately: "I understand perfectly well that by disturbing an artist busy at work, one causes him to lose patience. So I do not hold it against you at all." And he made me stay for supper during which there was no mention made of my wrongdoing (Souvenirs, III, 31-32). An oval miniature copy of the present portrait by Auguste Louis Jean Baptiste Riviere, signed and dated 1799, appeared at the Heckett sale, New York, Sotheby Parke-Bernet, October 5, 1977, lot 319, where it was incorrectly entitled "Portrait of Stanislas I. " ENGRAVINGS: Ignatius KIauber, 1798; Jacques Noel Fremy; and Grevedon, 1826. PROVENANCE: Collection of the artist; bequeathed by her with five other paintings to her niece, Eugenie Tripier Le Franc; to her husband Justin Tripier Le Franc; bequeathed by him to the Louvre, 1881; entered the museum after his death in 1883; transferred to the Musee National du Chdteau de Versailles, 1921. EXHIBITIONS: Paris, Salon, an X , no. 916; Paris, Exposition au profit de la Caisse de Secours des Artistes, 1860, no. 195. SELECTED REFERENCES: Souvenirs, 111, 36, 347; Pillet, 1890, p. 38; Nolhac, 1908, p. 116, illus. facing p. 116; Heim, [19151, pp. 130, 126; Hautecoeur, , p. 111; Blum, 1919, p. 102; Mycielski and Wasylewski, 1927, pp. 68-70, 138, cat. pp. 8-9, no. 16, illus. facing p. 68; A. Ryszkiewicz, "Deux portraits polonais au Musee de Kiev," Omagiett lui George Oprescu, 1961, p. 516; A. Ryszkiewicz, "L'Iconographie francaise de Stanislas Auguste," Bulletin du Mus@e Narodowe [Warsaw], 1966, p. 63, illus. P. 59; Z. Batowski, Malarki Stanislawa-Augusta, Wroclaw, 1951, pp. 49-59; A. Ryszkiewicz, 1979, pp. 17, 40.